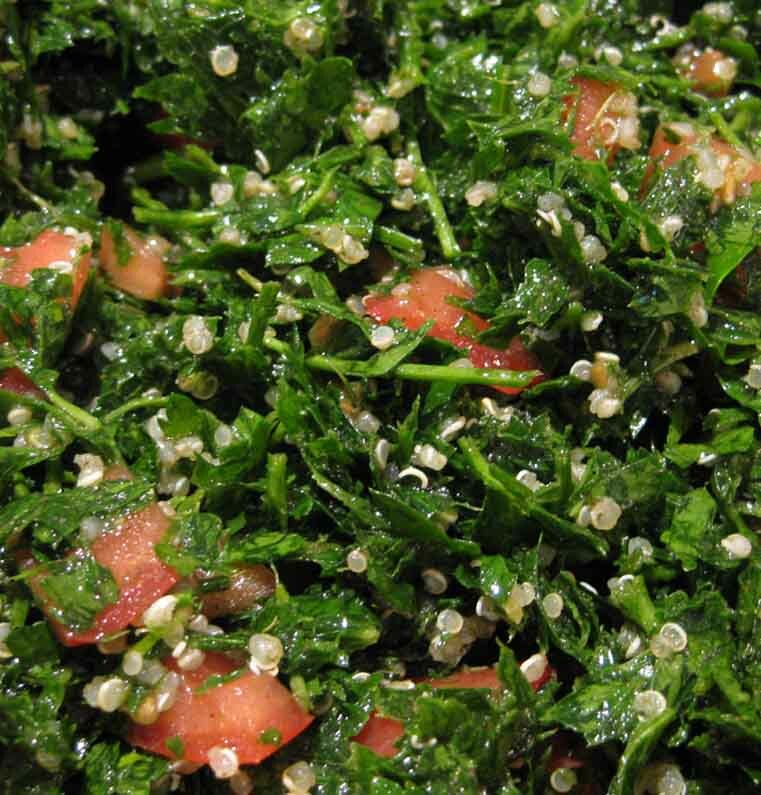 Tabouli (also spelt Tabbouleh) is a traditional parsley salad with its origins in the Arab world. There are various versions in most Arabic cultures, and it usually contains burghul, which is a variety/form of wheat or sometimes couscous (also from wheat). This recipe is adapted to be made grain-free and of course gluten-free from the family recipe from my Lebanese in-laws. They are from the beautiful coastal city of Jounieh so I guess that makes this recipe as authentic as you can get, as I was taught how to make it by my Lebanese sister-in-laws. 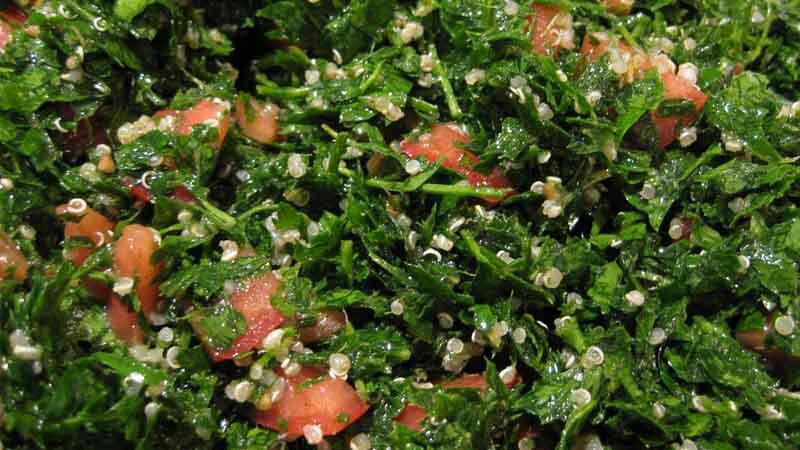 The very nature of Tabouli makes it hard to provide quantities (although skip to the end if you want to see my estimates for Tabouli for one), as everything is just eyeballed and amounts adjusted according to how much parsley you are using and how many people you wish to feed. The way to “grain/gluten-free” it is so simple – I just replace the bulgur/burghul with quinoa. If you want to be paleo or prefer not to use quinoa then you can just leave out the quinoa altogether and use hemp seeds, cauliflower rice, or leave the burghul substitute out completely. Parsley, and lots of it. Pre-cooked and cooled quinoa (about a cup) for an authentic taste or sesame seeds, chia seeds or even pine nuts, which will taste fine but the flavour will not be authentic tabouli. So, the first thing you need for a good Tabouli is parsley and lots of it. It’s hard to say “this many” bunches as the size can really vary from supplier to supplier or perhaps you are picking from your own backyard crop. I generally get a LARGE stainless steel bowl and fill it to overflowing with parsley leaves (you want the leaves but not the stalks). 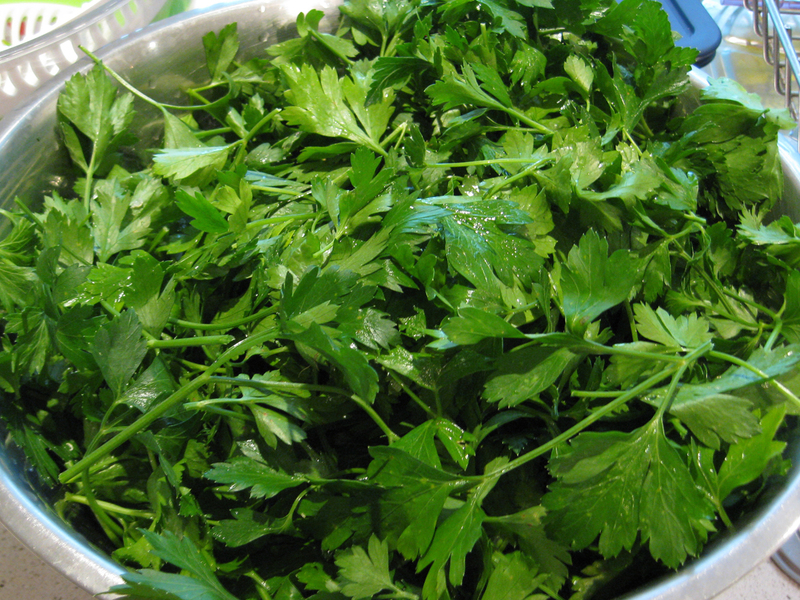 It probably equates to up to 6 bunches of parsley. You can use either the continental parsley flat leaf, which I have used here or the curly leaf parsley, both work fine, although the purists will tell you to use the flat leaf variety. Then you need a good handful of mint leaves. Say, half a bunch. This needs to be finely chopped, along with the shallots, if you are using them. You need a few “strands” of shallots, although I often leave this out. I use the white “juicy” part of the shallot. Say just 2 or 3. These are also called green onion or scallions. If you are using quinoa, then you need about 1 cup of cooked quinoa. If you are not sure how to prepare and cook quinoa, you can check out this link which has a good outline of how to do it. Then you need a few nice ripe tomatoes. How many I end up using really depends on how big the tomatoes are, but I would say at least 4 and up to 6 or 7. 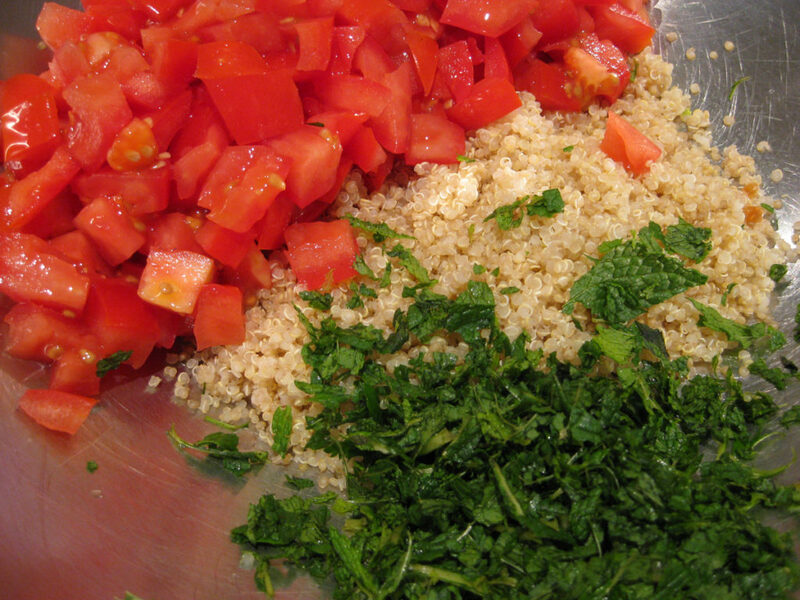 The start of making tabouli – the chopped tomato, cooked quinoa and chopped mint. So the first things added to the largest bowl you have are the quinoa, chopped tomatoes and the chopped mint. This is the stage I was taught to add the dressing – apparently it helps to get a more even coverage when you add the parsley last. So into this bowl you add about 1 tsp (or to taste) of sea salt, 1 to 2 tsp of allspice, the juice from 2 lemons (start with that, you can add more later) and a HEAP of olive oil. I just pour that oil in. You are aiming at using 2 to 3 times oil to the lemon juice you added. I probably start with about 1/2 a cup and adjust it/add more oil after I add the parsley. The parsley just soaks up the dressing. The juicy base for tabouli. Just need to add the parsley now. It should be very wet with lots of dressing. Now, the last thing you add is the finely chopped parsley. I actually use my Thermomix to chop my parsley. 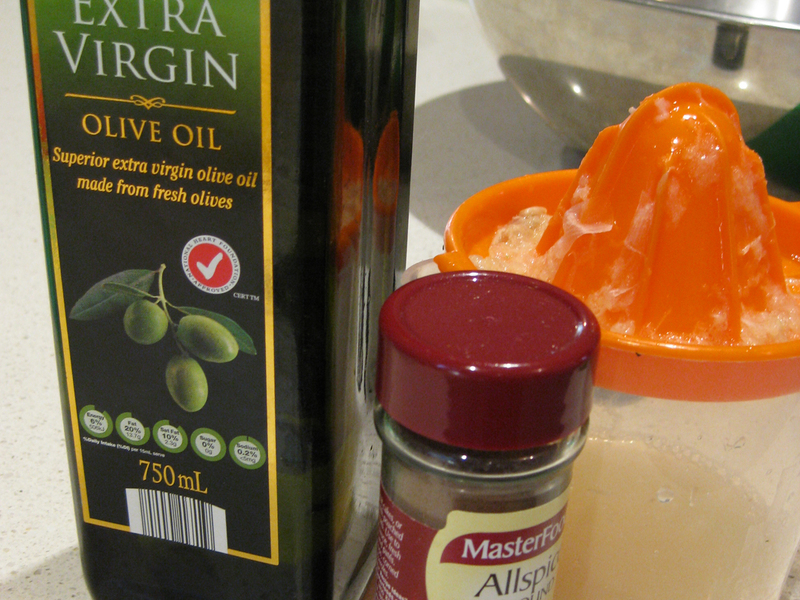 A good food processor will also make quick work of it, otherwise, its just chopping the old-fashioned way. Its a lot of parsley and it takes a while. 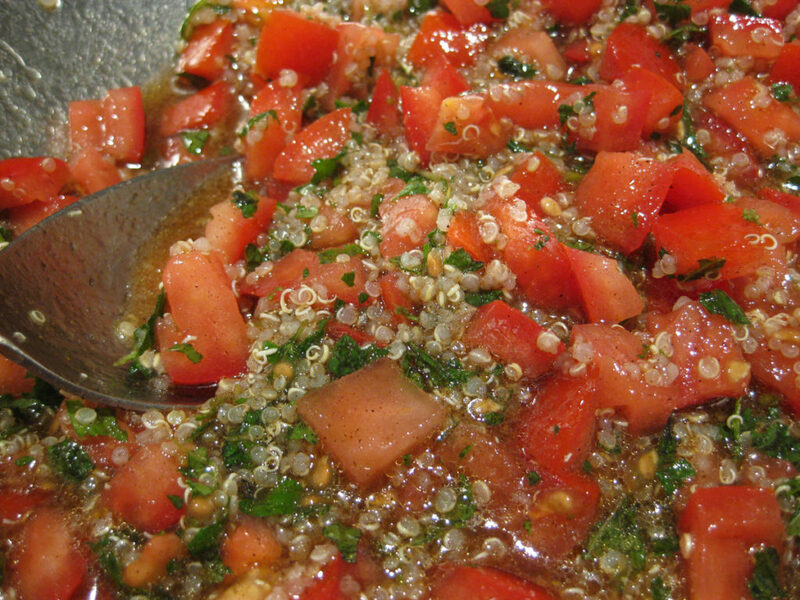 Olive oil, lemon and allspice – these plus salt for the perfect authentic tasting tabouli. And finally, you have the finished product – an authentic tasting Lebanese Tabouli – without the grains and enough to feed a hungry family. Add BBQ chicken or lamb and lots of garlic sauce for the complete experience. If I was making this just for myself/one person I would use 1 bunch of parsley, a handful of mint leaves (say about 12), the white part of one shallot/scallion, a 1/4 cup of cooked quinoa or cauliflower rice, 1/2 to one tomato depending on its size, 1/2 tsp allspice, 1/4 tsp salt, juice of one lemon and enough olive oil to nicely coat the parsley, which would probably end up being around a couple of tablespoons to 1/4 cup of oil, perhaps more, depending on the parsley. This salad does not taste oily at all, but it is a very high fat salad – of the good kind, and as a result it is very filling and very nutrient dense.